2017-02-28 Application filed by Solvay Specialty Polymers Italy S.P.A. filed Critical Solvay Specialty Polymers Italy S.P.A. The invention pertains to a polyunsaturated compound having formula (I) [compound (DAIC-PFPE)]: TA-O-Rf-TA' wherein: - Rf is (per)fluoropolyoxyalkylene chain [chain (Rf)] comprising recurring units having at least one catenary ether bond and at least one fluorocarbon moiety; TA and TA', equal to or different from each other, are selected from the group consisting of: (i) C1-C24 (hydro)(fluoro)carbon groups, possibly comprising one or more than one of H, O, and CI; and (ii) (hydro)(fluoro)carbon group comprising at least one diallylisocyanurate group of formula (A) wherein each of R1, R2, R3, R4, R5, and R6 is, independently, a hydrogen atom or a C1-C3 hydrocarbon group, preferably a hydrogen atom (group TDAIC), with the provisio that at least one of TA and TA' is a group TDAIC, to a process for its manufacture and its use for curing fluoroelastomers, to fluoroelastomer compositions comprising the same, as well as to a process for producing fluororubber mouldings therefrom. This application claims priority to European application No. 16159804.0 filed March 11th, 2016, the whole content of this application being incorporated herein by reference for all purposes. The present invention relates to novel polyunsaturated crosslinking agents useful as curing agents for fluoroelastomers, to a process for their production and their use, to fluoroelastomer compositions comprising the same, as well as to a process for producing fluororubber mouldings therefrom. Vulcanized (per)fluoroelastomers are materials with excellent heat-resistance and chemical-resistance characteristics, which are generally used in the manufacture of technical articles such as sealing parts, pipes, oil seals and O‑rings in which the leaktightness, the mechanical properties and the resistance to substances such as mineral oils, hydraulic fluids, solvents or chemical agents of diverse nature must be ensured over a wide range of working temperatures, from high to very low temperatures. Low temperature flexibility refers to the temperature, at or below which an elastomer vulcanizate changes from an elastomeric, to a stiff, glassy state, at which point the vulcanizate is no longer flexible, and does not exhibit the ability to recover after being deformed. Several tests are useful for determining the lowest temperature at which fluoroelastomers retain their elastomeric properties, including Temperature of Retraction (TR-10), Glass Transition Temperature (Tg), and the like. Fluoroelastomers in general have low temperature properties dictated by two factors: the size of the fluorine atom and the substituent fluorocarbon molecules (e.g. trifluoro and trifluoroalkoxy groups) and the various intermolecular molecular forces that come into play due to fluorine’s high electronegativity. Within this frame, efforts have been devoted in the past to the modification of the fluoroelastomer polymer chain structure, e.g. via incorporation of specific monomers having bulkier pendant side chains and/or to the provision of curable formulation possessing appropriate additives for extending elastomeric domain. The presence of a bulky branch group (methyl, trifluoromethyl or perfluoroalkoxy) causes the polymerization to create the “random walk” chain configuration that is necessary for a “rubbery” elastomer. It is also worth reminding that compounding approaches have been pursued in this area, based on the incorporation of perfluoropolyethers additives, which, thanks to their miscibility with the fluoroelastomeric matrix, and more importantly, thanks to their very low Tg, may deliver advantages in overall low temperature behaviour of fluoroelastomer compounds comprising the same. In this area, EP 0222408 A AUSIMONT SPA 19870520 discloses vulcanizable compositions of fluoroelastomers based on vinylidene fluoride, comprising a fluoropolyether as processing aid; similarly, US 4278776 MONTEDISON SPA 19810714 discloses the use of perfluoropolyethers processing aids in VDF-based fluoroelastomers; in particular performances obtained with perfluoropolyether greases consisting of mixtures of an oil and PTFE particles were compared to those of a perfluoropolyether polyamide in curable fluoroelastomer compounds. In all these documents, adjunction of the perfluoropolyether processing adjuvant was found to be accompanied by a significant reduction of hardness and mechanical properties (modulus). Also, these materials, due to their inherent volatility, undergo migration phenomena and could exude from the cured parts in high temperature operating conditions, so that failures occur and performances of said parts are significantly affected. Now, dynamic seal applications with fluoroelastomer-based products may require parts to maintain elastomeric behaviour at temperatures as low as -40°C, and in some cases, even lower temperatures. This low temperature rubber behaviour is still required to be associated to suitable mechanical performances (tensile strength, hardness). this compound being possibly able to connect up to three fluoroelastomer chains in a constrained cross-linked structure. Now, it is believed that an increase in crosslinking density, which may be beneficial for mechanical performances, may nevertheless reduce the macromolecular chain mobility and flexibility, as associated to low temperature behaviour, and having a detrimental effect with these regards. There is hence a continuous search for curing systems which, while delivering cross-linked structure with expected crosslinking density, so delivering mechanical properties as required for different fields of use, yet maintain or even improve the low temperature behaviour of the fluoroelastomer base gum, and hence extending continuous use domain for cured parts down to -40°C or beyond, while still maintaining all advantageous performances (mechanical properties, sealing properties). There is thus still a continuous quest in the art for fluoroelastomer compositions that can deliver cured parts having low temperature elastomeric behaviour. The object of the present invention is therefore to provide a novel polyunsaturated compound for the curing of fluoroelastomers which, when used as crosslinking agent (alone or in combination with other polyunsaturated curing agents), enables obtaining cured parts possessing an improved mechanical properties/low temperature behaviour compromise, making hence available solutions for addressing requirements for extreme continuous operation conditions (e.g. -40°C or below). with the provisio that at least one of TA and TA’ is a group TDAIC, as above detailed. 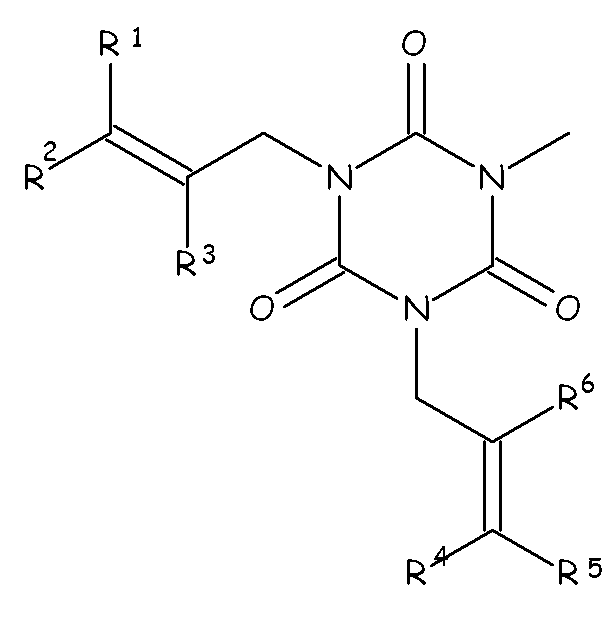 The Applicant has surprisingly found that this diallylisocyanurate (per)fluoropolyether derivative, associating diallylisocyanurate group(s), acting as polyunsaturated reactive moieties for crosslinking, to a flexible (per)fluoropolyoxyalkylene chain conferring increased molecular mobility, is an effective crosslinking agent, either when used alone or in combination with traditional polyunsaturated curing agents, delivering an improved compromise between low temperature behaviour and mechanical properties. The expression diallylisocyanurate (per)fluoropolyether derivative and compound (DAIC-PFPE) are hereby understood to designate one or more than one compounds of formula (I) as above detailed. The (per)fluoropolyoxyalkylene chain [chain (Rf)] of compound (DAIC-PFPE) is preferably a chain comprising a plurality of recurring units (R1), said recurring units having general formula: -(CF2)k-CFZ-O-, wherein k is an integer of from 0 to 3 and Z is selected between a fluorine atom and a C1-C6 perfluoro(oxy)alkyl group. - a’, b’, c’, d’, e’ are integers ≥ 0. - a”, b”, c” are integers ≥ 0. Chain (Rf ) is generally selected so as to possess a number averaged molecular weight of 500 to 6000, preferably of 750 to 5000, even more preferably of 1000 to 4500.
,with the provisio that at least one of TB and TB’ is a group TDAIC*, as above detailed. with the provisio that at least one of TB and TB’ is a group TDAIC”, as above detailed. Compounds (DAIC-PFPE) as above detailed, may be provided, as a consequence of their synthetic methods and precursors used, as mixtures of compounds comprising different chemical entities differing because of the nature and length of the (per)fluoropolyoxyalkylene chain, maybe comprise variable fractions of compounds wherein both chain ends are (hydro)(fluoro)carbon groups comprising at least one diallylisocyanurate and of compounds wherein only one chain end is (hydro)(fluoro)carbon groups comprising at least one diallylisocyanurate, and maybe associated to minor amounts of side products of similar structure, but wherein both of chain ends of the (per)fluoropolyoxyalkylene chain fails to be bound to a diallylisocyanurate group. With regards to the proportion of so-called “mono” and “di” functional compounds, it is generally understood that best results have been achieved when the compound (DAIC-PFPE) consisted of a majority of compounds of formula (I) [TA-O-Rf-TA’] as above detailed, wherein both TA and TA’ were groups TDAIC, as above detailed [di-functional (DAIC-PFPE)], and a minor amount of compounds of formula (I) [TA-O-Rf-TA’] as above detailed, wherein only one of TA and TA’ is a group TDAIC, the other group being free from diallylisocyanurate (DAIC) moiety [mono-functional (DAIC-PFPE)]. While di-functional (DAIC-PFPE) and mono-functional (DAIC-PFPE) may be separately and individually used in a fluoroelastomer composition, the compound (DAIC-PFPE) is generally a mixture of di-functional (DAIC-PFPE) and mono-functional (DAIC-PFPE). When the compound (DAIC-PFPE) is provided as a mixture of compounds (DAIC-PFPE), in the said compounds (DAIC-PFPE) mixture, the amount of di-functional (DAIC-PFPE) compounds and mono-functional (DAIC-PFPE) compounds are generally such that the groups TDAIC are representative of at least 80 % mol, preferably at least 85 % moles, more preferably at least 90 % moles of all end groups of compounds (DAIC-PFPE). While it may be possible to isolate compound (DAIC-PFPE) as pure compounds, very minor amounts of the said side products are not detrimental, and to the sake of economy, may be tolerated in admixture with compound (DAIC-PFPE). The amount of those “non-functional” compounds, which may be tolerated in admixture with compound (DAIC-PFPE) is generally such that the overall amount of end groups free from DAIC is of less than10 % moles, preferably less than 7 % moles, more preferably less than 5 % moles, with respect to the total number of end groups of the mixture of compounds (DAIC-PFPE) and non-functional side products. - a group of any of formulae -CF3, -CF2Cl, -CF2CF3, -CF(CF3)2 , -CF2H, -CFH2, -CF2CH3, -CF2CHF2, -CF2CH2F, -CFZ*CH2OH, -CFZ*COOH, -CFZ*COORh and –CFZ*-CH2(OCH2CH2)k-OH, wherein k is ranging from 0 to 10, wherein Z* is F or CF3; Rh is a hydrocarbon chain. - each of W* and W*’, equal to or different from each other, are selected from groups of any of formulae -CF3, -CF2Cl, -CF2CF3, -CF(CF3)2 , -CF2H, -CFH2, -CF2CH3, -CF2CHF2, -CF2CH2F, -CFZ*CH2OH, -CFZ*COOH, -CFZ*COORh and –CFZ*-CH2(OCH2CH2)k-OH, wherein k is an integer comprised ranging from 0 to 10, wherein Z* is F or CF3; Rh is a hydrocarbon chain. Compounds (DAIC-PFPE) can be synthesized applying to available PFPE precursors suitable chemistry so as to introduce diallylisocyanurate groups in chain ends. The invention also addresses a method for manufacturing compounds (DAIC-PFPE), said method comprising reacting a (per)fluoropolyether precursor compound comprising a (per)fluoropolyoxyalkylene chain [chain (Rf)] comprising recurring units having at least one catenary ether bond and at least one fluorocarbon moiety, as above detailed, and possessing at least one reactive chain end, with at least one compound including a diallylisocyanurate group. with the provisio that at least one of J and J’ is a group (JOH), as above detailed. (mm) hydroxyl-containing groups [groups (JOH’)] of any of formulae -CFZ*CH2OH, and –CFZ*-CH2(OCH2CH2)k-OH, wherein k is ranging from 0 to 10, wherein Z* is F or CF3. According to certain embodiments, the hydroxylated (per)fluoropolyeher precursor compound may be preliminarily reacted with an activating compounds, so as to activate the hydroxyl end chain to nucleophilic substitution. Choice of the activating compound is not limited, and typical organic chemistry strategies may be applied. - phosphonyl halides of formula: PX”3, wherein X” = Cl, Br. wherein X’ in all formulae here above has the same meaning as above detailed. As a result of the preliminary reaction with the activating agent, according to these embodiments, the hydroxyl chain end(s) of the hydroxylated (per)fluoropolyeher precursor compound is/are transformed into more reactive group(s), e.g. halides (when using sulfuryl halides or phosphonyl halides, as above detailed), or sulfonyl esters groups of formula –O-SO2-O-Rs, with Rs being a C1-C12 hydrocarbon radical, linear or branched, possibly fluorinated (preferably perfluorinated) (when using organic sulfonyl halides, as above detailed). Reaction of these activated derivatives of the hydroxylated (per)fluoropolyeher precursor compound with –NH- group of diallyl isocyanurate has been found to proceed with high yields and selectivity, in particular when using nonafluorobutanesulfonyl ester derivatives. The invention further pertains to a method for crosslinking a fluoroelastomer, comprising using compound (DAIC-PFPE), as above detailed. - at least one compound (DAIC-PFPE), as above detailed, said compound (DAIC-PFPE) being comprised in the composition in an amount of 0.5 to 50 phr, with respect to fluoroelastomer (A). As said, compound (DAIC-PFPE) is comprised in the composition in an amount of 0.5 to 50 phr, with respect to fluoroelastomer (A). 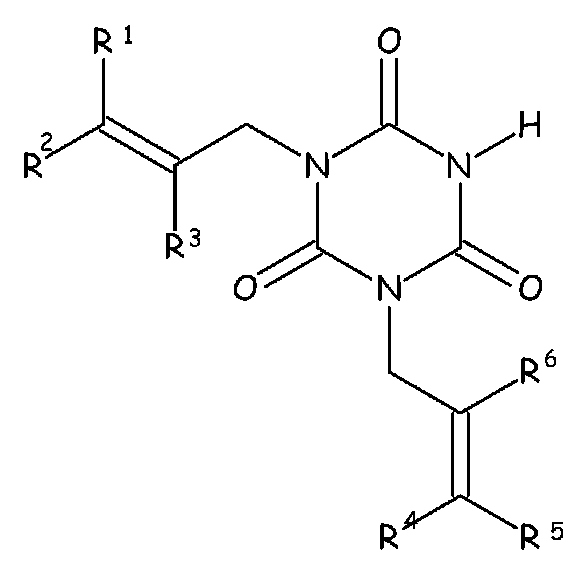 More specifically, compound (DAIC-PFPE) is present in composition (C) in an amount of at least 3 phr, preferably at least 5 phr, more preferably at least 7 phr, and/or in an amount of preferably at most 30 phr, more preferably at most 25 phr. 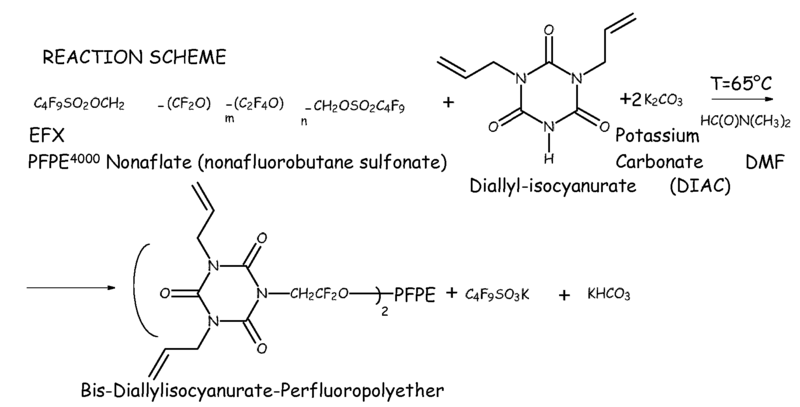 The amount of compound (DAIC-PFPE) will be optimized by one of ordinary skills in the art, considering notably whether any additional curing (co)agent is employed or whether the compound (DAIC-PFPE) is the sole polyunsaturated crosslinking agent used in the composition (C) for effecting curing of the fluoroelastomer (A). For the purposes of this invention, the term “(per)fluoroelastomer” [fluoroelastomer (A)] is intended to designate a fluoropolymer resin serving as a base constituent for obtaining a true elastomer, said fluoropolymer resin comprising more than 10 % wt, preferably more than 30 % wt, of recurring units derived from at least one ethylenically unsaturated monomer comprising at least one fluorine atom (hereafter, (per)fluorinated monomer) and, optionally, recurring units derived from at least one ethylenically unsaturated monomer free from fluorine atom (hereafter, hydrogenated monomer) . True elastomers are defined by the ASTM, Special Technical Bulletin, No. 184 standard as materials capable of being stretched, at room temperature, to twice their intrinsic length and which, once they have been released after holding them under tension for 5 minutes, return to within 10 % of their initial length in the same time. wherein each of Rf3, Rf4, Rf5, Rf6, equal to or different from each other, is independently a fluorine atom, a C1-C6 fluoro- or per(halo)fluoroalkyl, optionally comprising one or more oxygen atom, e.g. -CF3, -C2F5, -C3F7, -OCF3, -OCF2CF2OCF3. Examples of hydrogenated monomers are notably hydrogenated alpha-olefins, including ethylene, propylene, 1-butene, diene monomers, styrene monomers, alpha-olefins being typically used. Fluoroelastomers (A) are in general amorphous products or products having a low degree of crystallinity (crystalline phase less than 20 % by volume) and a glass transition temperature (Tg) below room temperature. In most cases, the fluoroelastomer (A) has advantageously a Tg below 10°C, preferably below 5°C, more preferably 0°C. 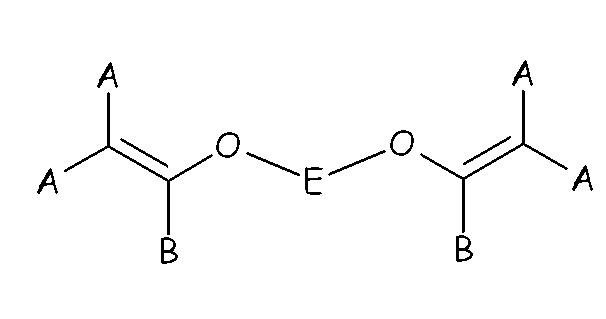 (2)	TFE-based copolymers, in which TFE is copolymerized with at least one comonomer selected from the group consisting of (c), (d), (e), (g), (h) and (i) as above detailed . wherein R1, R2, R3, R4, R5 and R6, equal or different from each other, are H or C1-C5 alkyl; Z is a linear or branched C1-C18 hydrocarbon radical (including alkylene or cycloalkylene radical), optionally containing oxygen atoms, preferably at least partially fluorinated, or a (per)fluoropolyoxyalkylene radical, e.g. as described in EP 661304 A AUSIMONT SPA 19950705 .
wherein each of A, equal or different from each other and at each occurrence, is independently selected from F, Cl, and H; each of B, equal or different from each other and at each occurrence, is independently selected from F, Cl, H and ORB, wherein RB is a branched or straight chain alkyl radical which can be partially, substantially or completely fluorinated or chlorinated; E is a divalent group having 2 to 10 carbon atom, optionally fluorinated, which may be inserted with ether linkages; preferably E is a –(CF2)m- group, with m being an integer from 3 to 5; a preferred bis-olefin of (OF-2) type is F2C=CF-O-(CF2)5-O-CF=CF2. wherein E, A and B have the same meaning as above defined; R5, R6, R7, equal or different from each other, are H, F or C1-5 alkyl or (per)fluoroalkyl group. (ix)	tetrafluoroethylene (TFE) 20-70 %, (per)fluoro-methoxy-vinylethers (MOVE) 25-75 %, (per)fluoroalkylvinylethers (PAVE) 0-50 %, bis-olefin (OF): 0-5 %. The fluoroelastomer (A) can be prepared by any known method, such as emulsion or micro-emulsion polymerization, suspension or micro-suspension polymerization, bulk polymerization and solution polymerization. According to certain embodiments of the invention, the fluoroelastomer (A) may comprise cure sites; the selection of cure sites is not particularly critical, provided that they ensure adequate reactive in curing in combination with the compound (DAIC-PFPE). The fluoroelastomer (A) can comprise said cure sites either as pendant groups bonded to certain recurring units or as end groups of the polymer chain. 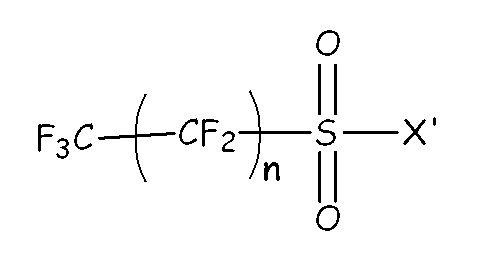 (CSM-2) ethylenically unsaturated compounds comprising nitrile (-CN) groups, possibly (per)fluorinated. 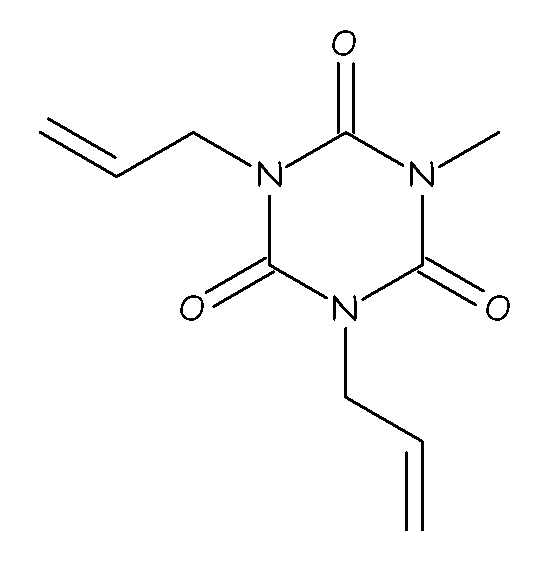 (CSM-1D) bromo and/or iodo alpha-olefins containing from 2 to 10 carbon atoms such as bromotrifluoroethylene or bromotetrafluorobutene described, for example, in US 4035565 DU PONT 19770712 or other compounds bromo and/or iodo alpha-olefins disclosed in US 4694045 DU PONT 19870915 . 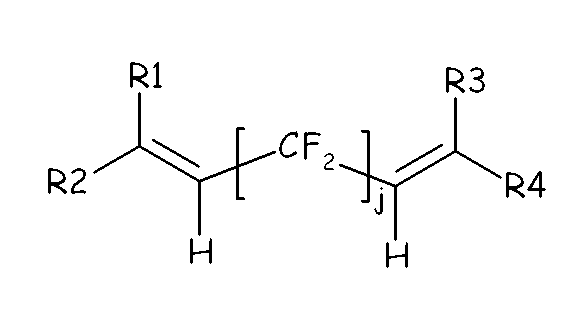 (CSM2-B) perfluorovinyl ethers containing nitrile groups of formula CF2=CF-(OCF2CFXCN)m’-O-CF2—CF(CF3)-CN, with XCN being F or CF3, m’ being 0, 1, 2, 3 or 4. Specific examples of cure-site containing monomers of type CSM2-A and CSM2-B suitable to the purposes of the present invention are notably those described in patents US 4281092 DU PONT 19810728 , US 4281092 DU PONT 19810728 , US 5447993 DU PONT 19950905 and US 5789489 DU PONT 19980804 . Within the frame of the present invention, preferred fluoroelastomer (A) to be used in combination with compound (DAIC-PFPE) are fluoroelastomers (A) comprising iodine and/or bromine cure sites. Iodine and/or bromine is generally comprised in the fluoroelastomer (A) in an amount of 0.001 to 10% wt, with respect to the total weight of fluoroelastomer (A). Among these, iodine cure sites are those selected for maximizing curing rate. According to this embodiment, for ensuring acceptable reactivity it is generally understood that the content of iodine and/or bromine in the fluoroelastomer (A) should be of at least 0.05 % wt, preferably of at least 0.1 % weight, more preferably of at least 0.15 % weight, with respect to the total weight of fluoroelastomer (A). On the other side, amounts of iodine and/or bromine not exceeding preferably 7 % wt, more specifically not exceeding 5 % wt, or even not exceeding 4 % wt, with respect to the total weight of fluoroelastomer (A), are those generally selected for avoiding side reactions and/or detrimental effects on thermal stability. These iodine or bromine cure sites of these preferred embodiments of the invention might be comprised as pending groups bound to the backbone of the fluoroelastomer (A) polymer chain or might be comprised as terminal groups of said polymer chain. - iodo and/or bromo fluoroalkyl vinyl ethers (as notably described in patents US 4745165 AUSIMONT SPA 19880517 , US 4564662 MINNESOTA MINING & MFG [US] 19860114 and EP 199138 A DAIKIN IND LTD 19861029 ). The fluoroelastomer according to this embodiment generally comprises recurring units derived from brominated and/or iodinated cure-site monomers in amounts of 0.05 to 5 mol per 100 mol of all other recurring units of the fluoroelastomer (A), so as to advantageously ensure above mentioned iodine and/or bromine weight content. - alkali metal or alkaline-earth metal iodides and/or bromides, such as described notably in patent US 5173553 AUSIMONT SRL 19921222 .
wherein Rf2 is selected from the group consisting of -CF2CF3; -CF2CF2OCF3; and -CF3 (MOVE3). With these regards, among above referred fluoroelastomers (A), VDF-based copolymers are particularly preferred and provide for increased crosslinking density, thus improved mechanical properties, while reducing the cost. - from 90 to 30 % moles, preferably from 85 to 40 % moles, more preferably from 83 to 50 % moles of recurring units derived from VDF. 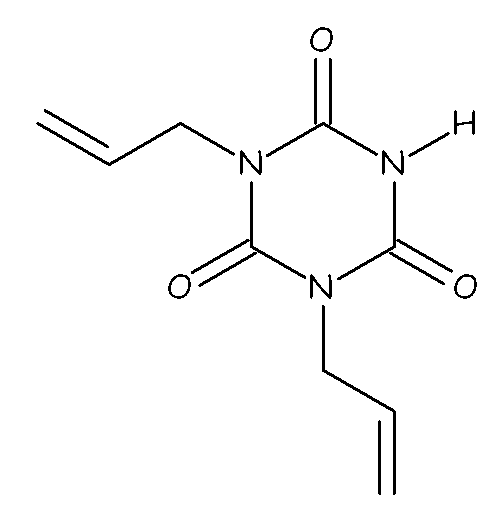 Preferably, the VDF-based polymers, as above detailed, are intended for peroxide curing; to this aim, they generally comprise iodine cure sites as terminal groups of the fluoroelastomer (A) polymer chain, as above detailed, generally in the amounts mentioned above. The composition (C) of the invention can be advantageously cured by peroxide curing technique. To this aim, the composition (C) generally further comprises at least one suitable peroxide that is capable of generating radicals by thermal decomposition. Organic peroxides are generally employed. Among most commonly used peroxides, mention can be made of dialkyl peroxides, for instance di-tert-butyl peroxide and 2,5-dimethyl-2,5-bis(tert-butylperoxy)hexane; dicumyl peroxide; dibenzoyl peroxide; di-tert-butyl perbenzoate; bis[1,3-dimethyl-3-(tert-butylperoxy)butyl] carbonate. Other suitable peroxide systems are those described, notably, in patent applications EP 136596 A MONTEDISON SPA 19850410 and EP 410351 A AUSIMONT SRL 19910130 , whose content is hereby incorporated by reference. 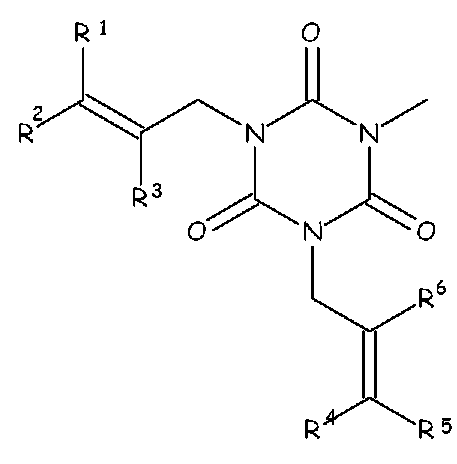 While compound (DAIC-PFPE) can be used as sole curing agent, in the composition (C), i.e. in the absence of any additional polyunsaturated compounds, embodiment’s wherein the composition (C) comprises at least one polyunsaturated curing coagent different from compound (DAIC-PFPE) are still encompassed by the scope of the present invention. According to these embodiment, the composition (C) further comprises at least one polyunsaturated compound different from compound (DAIC-PFPE), in amounts generally of from 0.5 to 10 phr, and preferably of from 1 to 7 phr, relative to 100 weight parts of fluoroelastomer (A). 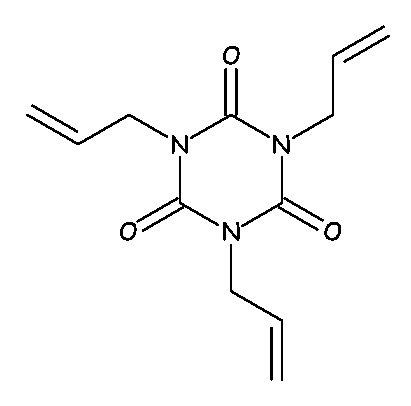 Among polyunsaturated compound which may be used in combination with compound (DAIC-PFPE), the following are commonly used : triallyl cyanurate; triallyl isocyanurate (TAIC); tris(diallylamine)-s-triazine; triallyl phosphite; N,N‑diallylacrylamide; N,N,N',N'-tetraallylmalonamide; trivinyl isocyanurate; 2,4,6-trivinyl methyltrisiloxane; bis-olefins (OF), as above detailed; triazines substituted with ethylenically unsaturated groups, such as notably those described in EP 860436 A AUSIMONT SPA 19980826 and WO 97/05122 (DU PONT [US]) 13/02/1997 ; among above mentioned curing coagents, TAIC and bis-olefins (OF), as above detailed, and more specifically TAIC and bis-olefins of formula (OF-1), as above detailed, have been found to provide particularly good results. (c)	other conventional additives, such as fillers, thickeners, pigmen­ts, antioxidants, stabilizers, processing aids, and the like. The invention also pertains to the use of the (per)fluoroelastomer composition as above described for fabricating shaped articles. The composition (C) can be fabricated, e.g. by moulding (injection moulding, extrusion moulding), calendering, or extrusion, into the desired shaped article, which is advantageously subjected to vulcanization (curing) during the processing itself and/or in a subsequent step (post-treatment or post-cure), advantageously transforming the relatively soft, weak, fluoroelastomeric uncured composition into a finished article made of non-tacky, strong, insoluble, chemically and thermally resistant cured fluoroelastomer material. Yet, the invention pertains to cured articles obtained from the composition (C), as above detailed. Said cured articles are generally obtained by moulding and curing the fluoroelastomer composition, as above detailed. these cured parts may be sealing articles, including O(square)-rings, packings, gaskets, diaphragms, shaft seals, valve stem seals, piston rings, crankshaft seals, cam shaft seals, and oil seals or maybe piping and tubings, in particular flexible hoses or other items, including conduits for delivery of hydrocarbon fluids and fuels. Cured articles obtained from the composition (C), thanks to their ability to provide very low glass transition temperatures, are suitable for being used in fields of endeavours wherein low service temperatures are encountered, e.g. in particular as aerospace sealing parts, as elastomeric parts for automotive applications, including e.g. CNG and LPG systems, as well as parts for gas and/or oil drilling in cold environments (including e.g. off-shore operations). Further in addition, the invention pertains to a method for processing the composition (C), as above detailed, according any of injection moulding, compression moulding, extrusion moulding, coating, screen printing technique, form-in-place technique. Should the disclosure of any of the patents, patent applications, and publications that are incorporated herein by reference conflict with the present description to the extent that it might render a term unclear, the present description shall take precedence. The present invention will be now described in more detail with reference to the following examples, whose purpose is merely illustrative and not limitative of the scope of the invention. TECNOFLON® PFR94 is a peroxide-curable iodine end group-containing perfluoroelastomer, comprising recurring units derived tetrafluoroethylene (TFE); and perfluoro-methylvinylether (FKM-1, hereinafter), commercially available from Solvay Specialty Polymers Italy S.p.A.
TECNOFLON® VPL X75545 FKM is a peroxide-curable iodine end group-containing fluoroelastomer, comprising recurring units derived from vinylidene fluoride (VDF) 60.5% by moles; tetrafluoroethylene (TFE) 17.5% by moles; and perfluoro-methoxy-vinylethers having formula CF2=CF-OCF2O-CF3 (MOVE3) 22% by moles (FKM-2, hereinafter), commercially available from Solvay Specialty Polymers Italy S.p.A.
Before beginning the synthesis, the necessary amount of Z-DOL must be dried by placing it in a round-bottomed flask and heated with magnetic stirring (900 – 1000 rpm) at 80°C under vacuum (0.1 mbar PRES). A three-necked, 1 liter round-bottomed glass reactor, equipped with a mechanical stirrer, a reflux condenser with an inert gas (N2) compensator on top to keep the system anhydrous and inert, dripping funnel and an internal thermometer, is charged with anhydrous Z-DOL (MW = 3811 g/mole; EW = 1975 g/eq; 500 g; 131 mmols; 253 meq) and dichloromethane. The mechanical stirrer was turned on to ca. 300rpm, and the dishomogeneous mixture is heated to 40°C. Therefore the solution of RM-60 and TEA (dishomogeneous) was dripped in about twenty-five minutes. Following complete addition, the reaction mixture was kept at 40°C with 300rpm stirring under N2 for a total reaction time of 5 hours. The complete conversion in nonaflate was verified by 19F-NMR of the crude reaction mixture, in particular by following the Z-DOL pre-terminal conversion. The crude reaction mixture was transferred to an adequate separatory funnel where the lower fluorinated phase was drawn-off and it was washed 3 times with 100ml of Ethanol at 96%. The washed nonaflate was then dried over MgSO4, filtered with 5 um PTFE membrane, and then the residual amount of solvent was evaporated at 50°C and 0.25 mbar residual Pressure employing a mechanical pump for a total distillation time of 3 hours. Nonaflate obtained=528.22 g of a clear, pale yellow liquid. Average MW = 4145 g/mole. 19 F-NMR: (vs. CFCl3; ppm) a: -51; -52.5; -54.5; b: -88; -90; c: -77.5; -79.5; e: -109.2; f: -120.2; g: -125.2; h: -81. In a 1 liter, three-necked round-bottomed glass reactor, equipped with a mechanical stirrer, a reflux condenser with an inert gas (N2) compensator on top to keep the system anhydrous and inert, an internal thermometer, and a solid dispenser or dripping funnel, was charged with diallyl-isocyanurate and anhydrous dimethylformamide (DMF). The mechanical stirrer stirrer was turned on to ca. 300rpm at 20°C to obtain a clear colorless, homogeneous solution. Therefore K2CO3 was slowly added with the solid dispenser in ca. 35minutes. Following complete addition, the crude –mixture solution was heated to 60°C for 2 hours. As the acid-base reaction proceeded, the solution turned from colourless to white, opalescent, due to the isocyanurate-salt formed. At the end of the thermal treatment, the previously prepared homogeneous, transparent tan solution of PFPE4000Nonaflate (176.06 g; MW = 4145 g/mol; EW = 2111g/eq; 0.0834 eq) in EFX (45ml) are slowly dripped in 4h with a dripping funnel. The reaction was kept at 60°C and 300 rpm for an additional 8 hours bringing the total reaction time to 12 hours. When the stirrer was turned off, the opalescent dishomogeneous crude reaction mixture separated in two phases. The lower was the fluorinated phase and the upper was hydrogenates phase. The complete conversion of the nonaflate was verified by 19F-NMR of the crude reaction mixture, in particular by measuring the concentration of C4F9SO3K salt formed in the upper-phase. The crude reaction mixture was filtered with 5 µm PTFE membrane from the formed salt. This two-phase solution obtained was transferred to an adequate separatory funnel and it was washed 2 times with aqueous 3% H3O+Cl- (1:1 v/v hydrogenates:water). The final pH of the H2O layer was ensured to be below 3 for the washing to be complete. The washed bis-diallylisocyanutate-perfluoropolyether was then dried over MgSO4, filtered with 5 µm PTFE membrane, and then the residual amount of solvent was evaporated at 85°C and 0.25 mbar residual Pressure employing a mechanical pump for a total distillation time of 2 hours. Bis-diallylisocyanutate-perfluoropolyether obtained = 150.11 g of a clear, pale yellow liquid. Ave. MW = 5348 g/mole. 1 H-NMR (vs TMS; ppm): d: +4.8; e: +4.65; f: +6.1; g:+5.45. FKM-1 and FKM-2 were compounded with the ingredients as detailed below in a open mill. Plaques were cured in a pressed mould at 160°C and then post-treated in an air circulating oven in conditions (1+4 hours at 230°C). t90 = Time to 90% state of cure (sec). The tensile properties have been determined on specimens punched out from the plaques, according to the ASTM D 412 C Standard. EB is the elongation at break in %. The Shore A hardness (3") (HDS) has been determined on 3 pieces of plaque piled according to the ASTM D 2240 method. Compression set (C-Set) values have been determined on O-rings (#214 class) according to the ASTM D 395-B method (70 hours at 200°C). Glass transition temperature (Tg) of cured specimens was determined according to ASTM D3418 and by TR10, determinted by TR test according to ASTM D1329. - releasing compression and determining maximum adhesion force by peel test (180°). Lower values of maximum adhesion force (MAF, in N) are representative of specimens having improved stiction behaviour (i.e. having a “non-stick” behaviour towards hard substrate, even after prolonged compression at high temperature). Curing recipe and conditions and properties of cured sample are summarized, respectively, in tables 1 and 2. 1: 45 % active dispersion of 2,5-dimethyl-2,5-di-t-butyl-peroxy-hexane in calcium carbonate, commercially available from Arkema under tradename Luperox® 101XL 45; 2: Triallyl isocyanurate (75 %) dispersion in silica, commercially available as Drimix TAIC 75 from Finco; 3: C-black N990 MT from Cancarb; 4: ZnO ReagentPlus® from Sigma Aldrich. - a”, b”, c” are integers ≥ 0, wherein chain (Rf) is generally selected so as to possess a number averaged molecular weight of 500 to 6000, preferably of 750 to 5000, even more preferably of 1000 to 4500. A method for manufacturing a compound (DAIC-PFPE) according to anyone of Claims 1 to 4, said method comprising reacting a (per)fluoropolyether precursor compound comprising a (per)fluoropolyoxyalkylene chain [chain (Rf)] comprising recurring units having at least one catenary ether bond and at least one fluorocarbon moiety and possessing at least one reactive chain end, with at least one compound including a diallylisocyanurate group. 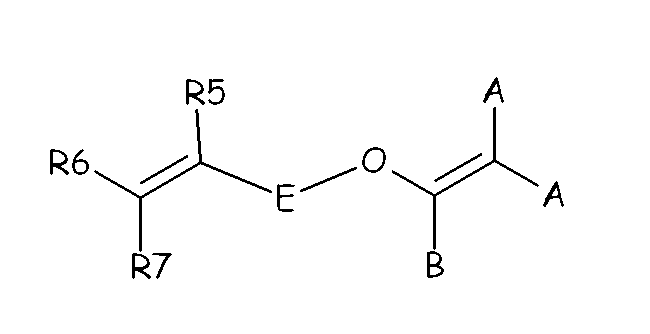 A method for crosslinking a fluoroelastomer, comprising using compound (DAIC-PFPE), according to anyone of Claims 1 to 4. - at least one compound (DAIC-PFPE), according to anyone of Claims 1 to 4, said compound (DAIC-PFPE) being comprised in the composition in an amount of 0.5 to 50 phr, with respect to fluoroelastomer (A). wherein R1, R2, R3, R4, R5 and R6, equal or different from each other, are H or C1-C5 alkyl; Z is a linear or branched C1-C18 hydrocarbon radical, optionally containing oxygen atoms, preferably at least partially fluorinated, or a (per)fluoropolyoxyalkylene radical. The composition (C) of anyone of claims 8 to 10, wherein the fluoroelastomer (A) comprises iodine and/or bromine cure sites, such as the iodine and/or bromine is present in an amount of 0.001 to 10% wt, with respect to the total weight of fluoroelastomer (A). The composition (C) of anyone of claims 8 to 12, said composition further comprising at least one peroxide, typically an organic peroxide, preferably selected from dialkyl peroxides, for instance di-tert-butyl peroxide and 2,5-dimethyl-2,5-bis(tert-butylperoxy)hexane; dicumyl peroxide; dibenzoyl peroxide; di-tert-butyl perbenzoate; bis[1,3-dimethyl-3-(tert-butylperoxy)butyl] carbonate. The composition (C) of anyone of claims 8 to 13, said composition comprising at least one polyunsaturated curing coagent different from (DAIC-PFPE) compound. A cured article obtained by moulding and curing the composition (C) according to anyone of claims 8 to 14, wherein the cured article may be selected from the group consisting of O(square)-rings, packings, gaskets, diaphragms, shaft seals, valve stem seals, piston rings, crankshaft seals, cam shaft seals, oil seals ,piping and tubings, in particular flexible hoses or other items, including conduits for delivery of hydrocarbon fluids and fuels. A method for processing the composition (C), according to anyone of Claims 8 to 12, according any of injection moulding, compression moulding, extrusion moulding, coating, screen printing technique, form-in-place technique.